One of the shortcomings of the Draft National Policy for Women 2016 is that it does not reflect regional concerns. Perhaps the expectation is that each state will come up with its own Policy guidelines but given the weakness of State Commissions for Women, there is no institutional advocate in most states that could push for such a document, leave alone engineer the consultations and debates that should precede the drafting of this document. Moreover, in the absence of truly wide-ranging consultations that reach beyond the usual suspects, the recommendations or guidelines as they stand are silent on a lot of key concerns for women. Based on the experiences of women in Tamil Nadu in the last few years, we at Prajnya drew up a short list of concerns that they would be well-served to have included in the National Draft Policy. I. Sexual and gender based inter-caste violence (‘Honour’ crimes): Since June 2013, civil society estimates 88 ‘honour’ killings in Tamil Nadu, with caste-mobs murdering young inter-caste couples, and sometimes even their families. Falling in love or marrying outside of caste boundaries is often threatened with sexual violence and murder. With no official estimates of such crimes, justice is often delayed or denied. The Draft National Policy as it stands does not consider the gendered consequences of the overlap of vulnerabilities—when caste or socio-economic status or minority or ethnic status already place you at a disadvantage, both women and men are even more vulnerable to human rights violations, including sexual and gender-based violence. II. The challenges faced by women refugees living in and out of camps in Tamil Nadu: There are over one lakh Sri Lankan refugees living in Tamil Nadu, close to 65,000 of them in refugee camps. Many of them live in cramped spaces without basic amenities like access to water and sanitation. Women and girls in these camps face sexual and gender based violence which goes frequently unreported. While life as refugees in India is difficult, going back to an unstable home in Sri Lanka is not an option for many. Displacement is a reality across India—both refugees and internally displaced persons. Women make up at least half of these numbers and yet, the Draft National Policy does not acknowledge or address their problems. III. Women and disasters: There is just one paragraph that mentions women’s needs in disaster contexts. Given the present frequency of climate change and human-made disasters, a gender-sensitive disaster risk reduction and mitigation policy is an urgent need that needs to be emphasised strongly. In states like Tamil Nadu, women are vulnerable to both natural (and climate change) disasters like last year’s floods as well as the slow disasters that might result from human-planned development and industrial projects gone awry. The National Policy should mandate their inclusion with voice in consultations and decision-making at every turn–from project planning, to land acquisition negotiations, to resettlement planning and to safety planning. IV. Workplace-related guidelines: While the Draft National Policy does address livelihood issues at length and emphasise the importance of workplace protections, we would like to draw attention to three situations where Tamil Nadu women would benefit from stronger national guidelines to protect their rights. a. Forced and bonded labour of women and girls in spinning mills: A study conducted by civil society organisations says about 100,000 girls and women are being exploited as bonded labour in the textile industry in the state, and frequently face sexual violence at the workplace. Following the suspicious death of a teenager in Tirupur in March, investigations have revealed poor living conditions, and exploitative ‘schemes’ endangering the safety and health of young women. b. Minimum wage for domestic workers in Tamil Nadu: Domestic workers are not covered under the Minimum Wages Act, and while some states have fixed a minimum wage, Tamil Nadu is not among them. There is also little awareness about their rights among domestic workers. Workplace sexual harassment, health insurance, decent working conditions are other areas of concern. c. Enumeration of manual scavengers, abolition of manual scavenging: While the TN Govt has claimed there are only 210 manual scavengers in the state, both the National Commission for Scheduled Castes as well as civil society organisations have rejected this number. The state has over 2 lakh unsanitary toilets, and as many as 27,659 households are serviced manually, with another 26,020 households serviced by animals. Night soil is usually collected by Dalit women, and this inhuman practice, while officially abolished, still persists. VI. Enabling Environment: The TN State Women’s Commission has been less and less active in the last decade, chaired by political appointees who have rarely reached out to women’s groups and other parts of civil society. The State and National Commissions are uniquely placed to serve as a bridge between government and civil society, and when they are more or less moribund, they are a wasted opportunity for a strong partnership between the two for social change. Civil society loses and institutional ally and the government loses the ability to genuinely connect with the public. The National Policy for Women should re-imagine the Women’s Commissions in a stronger form and mandate their constitution as an independent, well-resourced and pro-active body. *Point V is the contribution of Ms. Renuka Bala of the Centre for Women’s Development Research. Normally, when asked about whether the government should do this or that to respond to an incident of violence or a gender equality violation, we are given to talking about the three fingers that point back. This is not because we think governments act perfectly all the time (no one does) but because we believe in the importance of proactive citizenship and in the role of civil society. Governments cannot do everything on their own; even when we delegate authority, a good part of the burden of social change remains with us–we are the ‘social’ in social change, after all. Having said that, we created this petition for a strong Women’s Commission in Tamil Nadu along with several civil society colleagues because such a body can be important to our work. The Commissions for Women at the National and State level occupy something of a hybrid and therefore, link, position between government and civil society. The Commission Chair and members are usually from civil society but appointed by the government of the day. They have the authorisation of government officials, giving them better access than most civil society advocates have. The Commission is a platform from which they can speak to contemporary issues and also the crisis of a given day. The secretariat and the resources of the Commission derive directly from government, giving them the advantage of both institutional memory and better resources. A strong, dynamic Commission is an asset to civil society because its members can draw on their old networks to anchor their work, and because Commissioners afford civil society quick access to government. So, if there is an incident in the districts, and local NGOs cannot get help, the Commission potentially can intervene to facilitate and make help available. A pro-active Chair and Commission could fashion an important role for itself in the journey towards social change. A retrogressive Chair and Commission could drag us down just as well. This is why it is important to us and to our colleagues to see that when the newly re-elected Tamil Nadu Chief Minister makes that appointment, she appoints the right person, someone we defined in our petition as “sensitive to gender issues, and has concretely contributed towards women’s empowerment.” Those engaged in the work of social change–and gender equality–in civil society need an institutional ally who will bring together the resources of government and the reach of civil society. If you care about gender equality, this should be important to you as well. 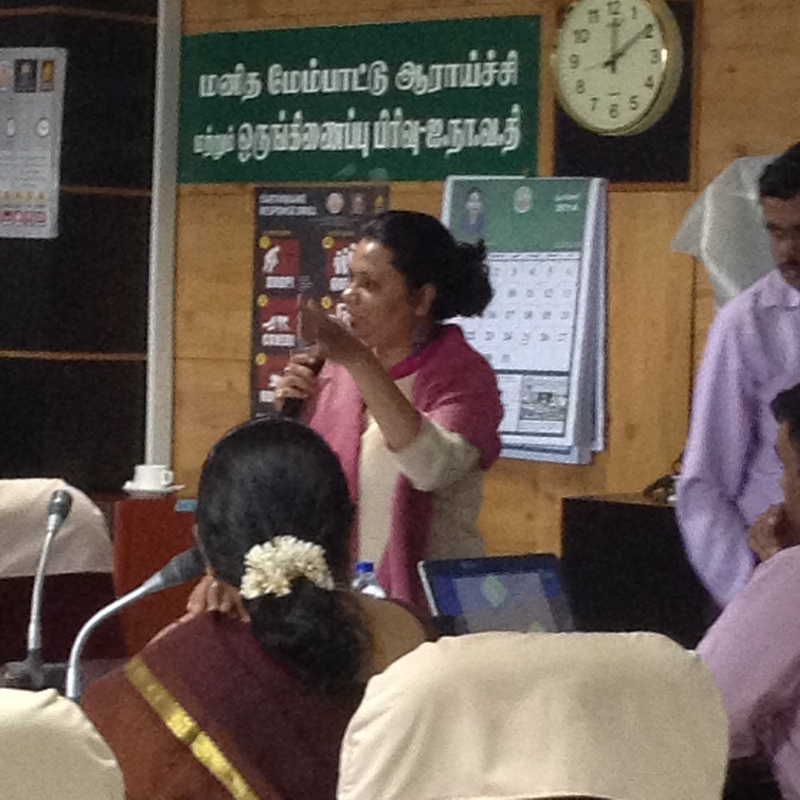 This roundtable session on how gender awareness has the potential to play a role in disaster management took place in the offices of the Tamil Nadu State Planning Commission. It centered around presentations by speakers from The Prajnya Trust, the All India Disaster Mitigation Institute, Swayam Shikshan Prayog, and the State Planning Commission. The other participants came from related state government departments. The focus of this session was primarily on formulation of policy on disaster management, based on the assumption that gender influences how people experience disasters as well as relief. The session opened with a brief statement of purpose by Mr Sugato Dutt, Member-Secretary of the Tamil Nadu State Planning Commission (TNSPC). It proceeded with a round of introductions, and a statement of welcome by the Vice Chairperson TNSPC, Ms Santha Sheela Nair. 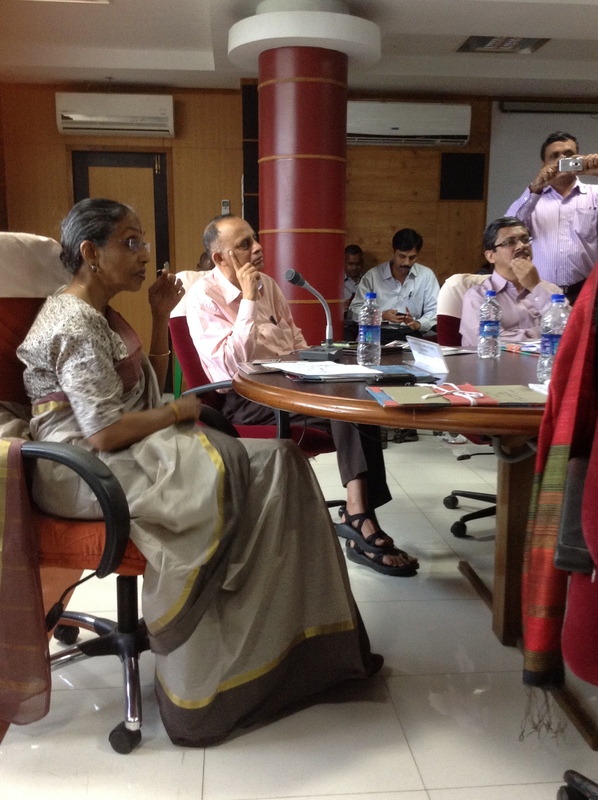 Dr Swarna Rajagopalan, Managing Trustee of The Prajnya Trust, made the first presentation. She gave the audience a comprehensive overview of the topic, and also pointed out that while we talk about gender awareness in policy making at length, we also need to consider the everyday impact of gender on the ground in a disaster situation. We need to examine the gendered consequences of disasters, and look for a way to address them. She added that there are varying guises of gender politics at play in disasters, including labour, safety, and the case of marginalized groups. Dr Rajagopalan drew attention to the shortcomings of a generalized policy of reconstruction rather than a context-specific one that takes advantages of existing systems of economic/political activity to create policies for relief. The main problem with generalized policies is the important observations they miss in their one-size-fits-all type of solution. For example, they often reinforce normative gender roles and ignore any possible existing subversion of them – women often engage in economic activity that promotes reconstruction, but this work is not recognized by relief organizations, let alone co-opted into their policy. Above all, there is a failure to recognize that there needs to be equal representation at all levels of reconstruction, from policy planning to the fieldwork. Gender awareness is not a little box on a checklist that needs to be checked, but a fuller understanding of any situation. Dr Rajagopalan stressed the need to look beyond the axioms of gender and disaster (such as the idea that women are always the most victimized class of people in a disaster; or even the idea that gender is only about women). In order to do this, she suggested we re-examine individual needs and contexts through three lenses: vulnerability, visibility and voice. The most important question to ask ourselves while going into a disaster situation is this: whose voice is seen as the default one? Whose is the most visible perspective? Very often, the answer to this question leaves us in no doubt that individuals experience a gendered reality. Thus, we need to reconsider assumptions about who are the most vulnerable populations in a disaster, and turn this around to reveal their potential for action and reconstruction. 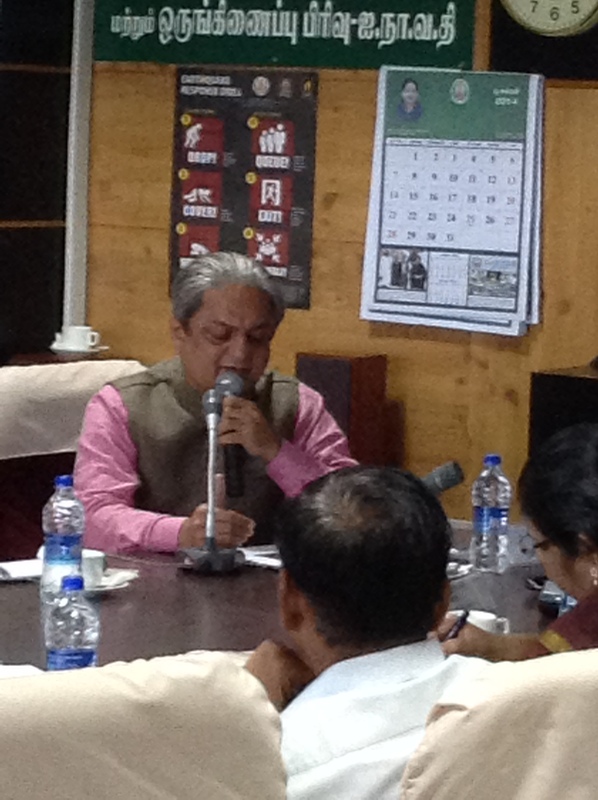 Mr Mihir Bhatt, Director of the All India Disaster Mitigation Institute, gave the second presentation. Speaking about Women in the Emergency Response Phase, Mr Bhatt looked at the results of a comprehensive study undertaken in 2014 to examine the impact of the response to tsunami relief in Indonesia, India and Sri Lanka, with a specific focus on Tamil Nadu. The study used various methodologies, including appreciative inquiry, group interviews, and some quantitative methods. Data was collected in 15 locations along the coast from Chennai to Kanyakumari, from over 1500 families. The focus of the study was to study the impact of two main measures of relief: shelter and livelihood. Mr Bhatt shared a few observations about the positive impact of relief measures in these two, and other (allied), areas. Firstly, he noted that the number of families that were counted as being below the poverty line (BPL) had decreased in the past ten years. Secondly, all children of school-going age were enrolled in and attended school regularly. Thirdly, the overall investment in houses (built by the government as part of the relief measures) had increased, improving the asset by addition of rooms, etc. Finally, though income from coastal fisheries had decreased, an increase was observed in inland fishing. Mr Bhatt suggested that these observations demonstrated that tsunami relief work has created social and economic opportunity in the affected regions. He also noted that there was a rising awareness of green energy at all levels, and this would have to be studied further. A question was raised about the role of Self Help Groups (SHG) in the affected regions. Mr Bhatt responded that the history of SHGs in the region meant that there was some familiarity with concepts like financial discipline and financial literacy, which was helpful for the recovery process. Another commenter shared a number of stories about women taking on leadership roles in situations arising from relief work, and the challenged these women face. Ms Vandana Chauhan gave the third presentation of the day, speaking about Lessons from the Post-Tsunami Decade on Women’s Agency and Leadership. She examined the findings of a comparative study undertaken in India, Indonesia and Japan. The study stressed the importance of action oriented emergency plans that were concise and readable. Ms Chauhan examined the requirements for capacity-building among women, and suggested that the following factors were most important: confidence, decision making power, setting up of a standard operating procedure in case of disasters. In her assessment of the impact of relief measures on affected areas, Ms Chauhan noted that relief measures related to livelihood, asset creation, access to primary healthcare centres (PHCs), education, and governance have been largely positive. In terms of livelihood, measures intended to augment income generation are still in effect today and continue to promote the independence of women. Asset creation can be observed in the form of developing opportunities for housing. Education in particular shows a positive trend: the demand for women’s education. All these situations present an opportunity for leadership, especially by women. Ms Chauhan closed with some lessons for the future. She advocated an increased awareness of the local context while enacting relief measures, as well as the use of traditional mechanisms and channels in incorporating the local community in relief programs. Ms Chauhan was of the opinion that this was important to ensure sustainable recovery. A commenter demonstrated how far relief work has come in the past couple of decades by comparing work in 1990 in Orissa and current relief work. It was noted that a key aspect of this improvement was better preparation. Some concern was also expressed about the position of children in disasters, especially with the increased risk of communicable diseases. An audience member also advocated a more streamlined bureaucracy to prevent doubling up of activities in relief work. Ms Prema Gopalan made the fourth presentation of the day, about Engaging Women in the Post-Disaster Reconstruction Process. She drew attention to the potential of disaster relief work as an opportunity for the empowerment of women. Looking at the activities and organization of women’s groups, Ms Gopalan also noted that gender affects men and women differently – and that it is particularly important to remember this while formulating policy on relief work. It is important to ensure that women are facilitators of recovery. It is also essential to recognize women’s role in mobilizing the community. In this regard, disasters create situations in which traditional social and cultural norms are broken, allowing for the participation and leadership of non-traditional classes – such as women. Pointing to case studies in Maharashtra, Tamil Nadu and Gujarat, Ms Gopalan demonstrated the success of local women as mobilizers and trainers in the community. Advocating for self-help, she recommended that communities should map their own vulnerabilities and capacities in planning disaster relief. Aid should be given directly to the affected communities rather than through bureaucratic channels. Investment by the government needs to be protected by community leadership, and women play a key role in monitoring this. In Ms Gopalan’s own experience, she found that infrastructure and services are protected in the long run if women are involved in the management of them. She also drew attention to the success of women-led preparedness task forces, where women wrote their own manuals for preparedness (against disasters). By viewing women as active agents in their communities, a new perspective emerges. The Vice-Chairperson of TNSPC asked if there was any resistance from men to the leadership of women. Ms Gopalan responded that there was some resistance at first, but in disaster sites, men did not object to women taking responsibility, and women themselves were eager to change the status quo. She reiterated the importance of disasters as an opportunity for women to change the status quo of gender relations. A question was raised about specific ways to encourage women’s leadership in disaster management. Ms Gopalan suggested that we need to have less specialization in NGOs, and that NGOs need to work in conversation with each other and the government. A question was raised about the increased participation of women in politics as a measure of women’s empowerment. Ms Gopalan felt that this doesn’t really promote women’s empowerment for various reasons. However, Dr Rajagopalan pointed out that the presence of women in politics is more of an intrinsic good since it represents more women in decision-making processes. Members of the TNSPC pointed out that NGOs need to function through the year rather than only in disaster situations. A commenter also raised the importance of educating boys at the school level to ensure gender sensitization. The Vice Chairperson noted the relief work done by religious organizations in Tamil Nadu. 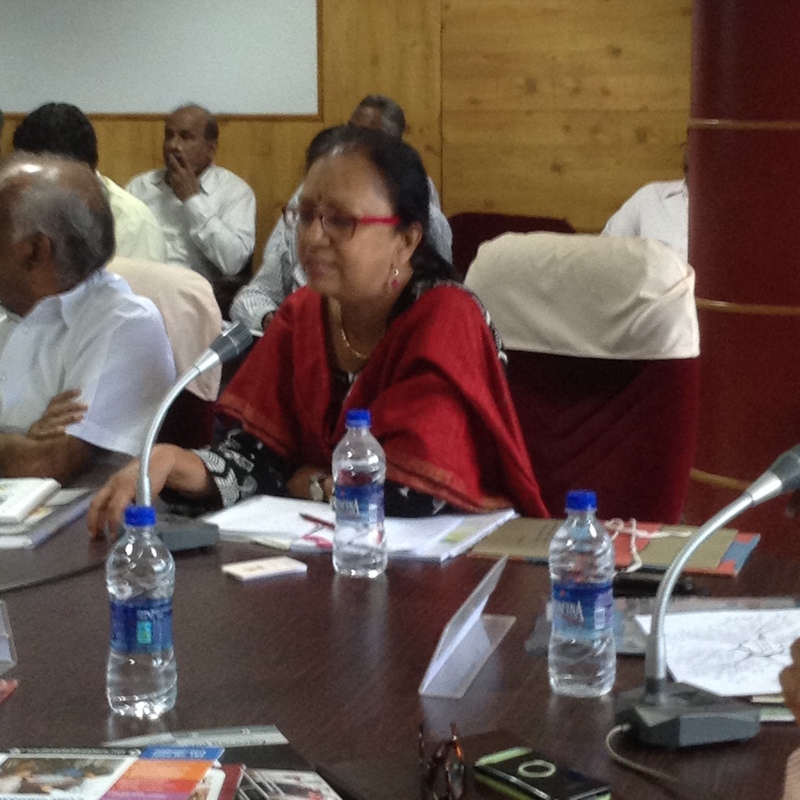 Ms Gopalan agreed that NGOs need to work together, with the facilitation of the government. She also reiterated the need to ensure that women are stakeholders in their own communities. A question was raised about the possibility of community monitoring of funds, given the controversial history of this initiative. Ms Gopalan was of the opinion that the success of this would depend on the government officers to a certain extent, and how responsive they are to the idea. Mr Bhatt also pointed to an example of community responsibility in Assam. Schoolteachers took responsibility in conducting safety audits in schools. He also emphasized the role of women schoolteachers in formulating safety codes for schools. 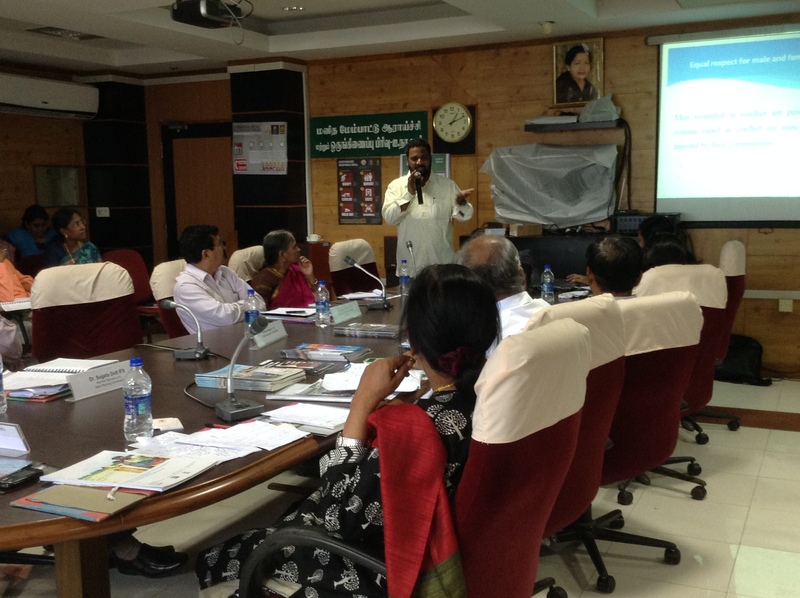 The final presentation of the day was made by a Consultant in disaster management and training in the TN State Disaster Management Agency on behalf of the Revenue Administration and Disaster Management Department. He drew attention to the common perception that one shouldn’t raise the cry of gender in a disaster situation. This perception is problematic, since women and men experience disaster in different ways. He stressed the need to have equal respect for male and female survivors. Speaking of some of the main features of TN Disaster Management, he spoke of the presence of planning at various levels, and various time frames. He also advocated the importance of increased participation of women at decision making levels, the importance of education about disaster management in schools, and incorporating SHGs in capacity building. The Vice Chairperson asked if women were really in a position of authority to make decisions rather than just filling up quotas on committees. The Consultant answered that they were part of committees, but lacked real power. A commenter pointed out that out of 5-6 lakh SHGs, 50% of them had real leadership by women, but not in the area of disaster management. 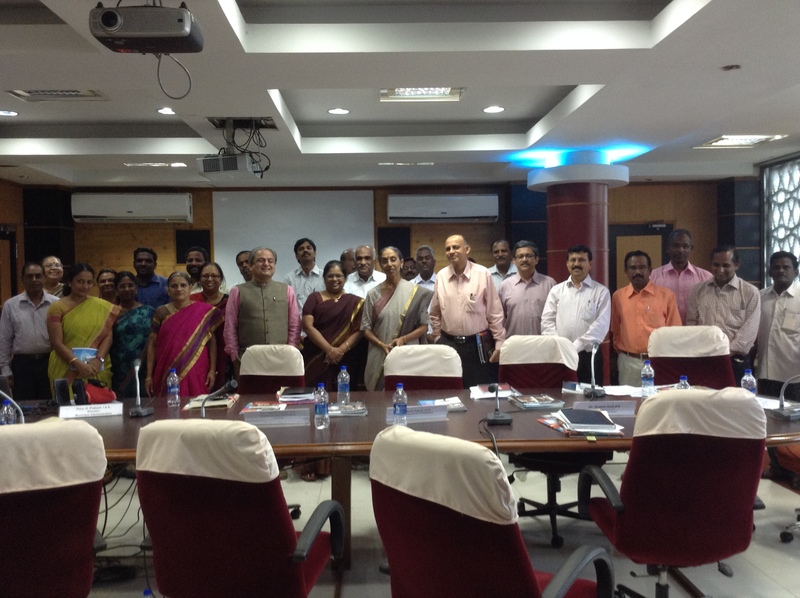 Interestingly, a commenter pointed out that 70% of the people who attend disaster management workshops are women. Are they including in decision making processes? Not really. However, there has been a growing change in this trend in recent times, especially at the community level, where there is more participation by women. The space has been created for women to make decisions, and this is a hopeful development. Ms Gopalan said that this needs to be taken to the higher levels od decision making too. Empowerment can be seen at the village level, but not at the Taluk and District levels. An audience member also pointed to the need to select attendees to training programs more carefully based on their capacities. There is also a need for training about disaster management in villages. 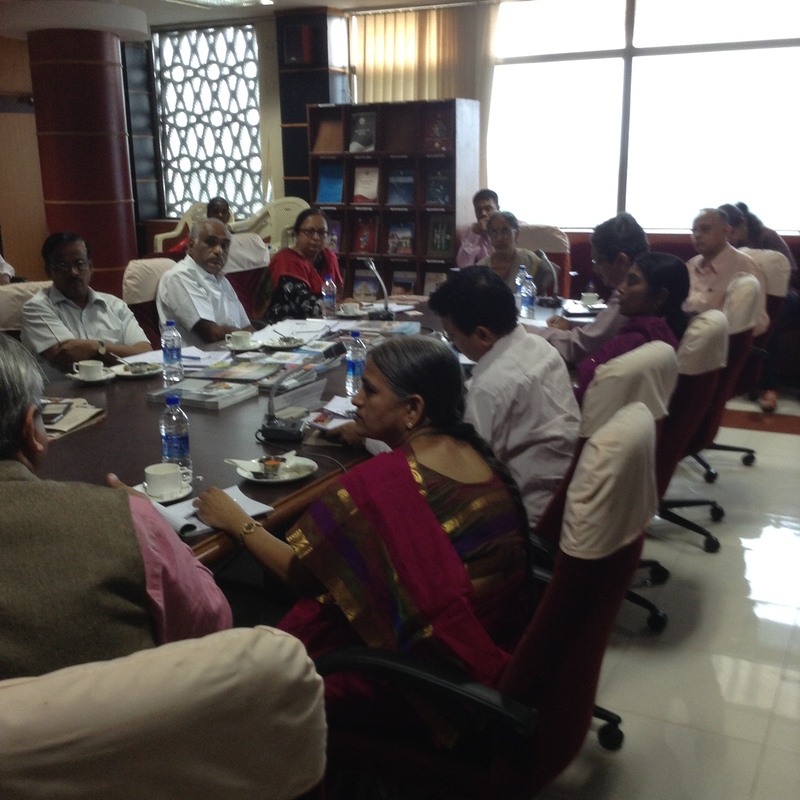 A suggestion was made to include Panchayat Level Federations in this initiative. Mr Bhatt asked if there was a difference in the way disaster management policy was formulated in rural and urban parts of Tamil Nadu. The Vice Chairperson asked if codes were in place for Chennai City. Members of the City Corporation answered that they were. The Revenue Department representative added that the Anna Institute of Management (AIM) was consulting with the TNSPC in the creation of a State Disaster Management Plan. Members of the AIM were also present. 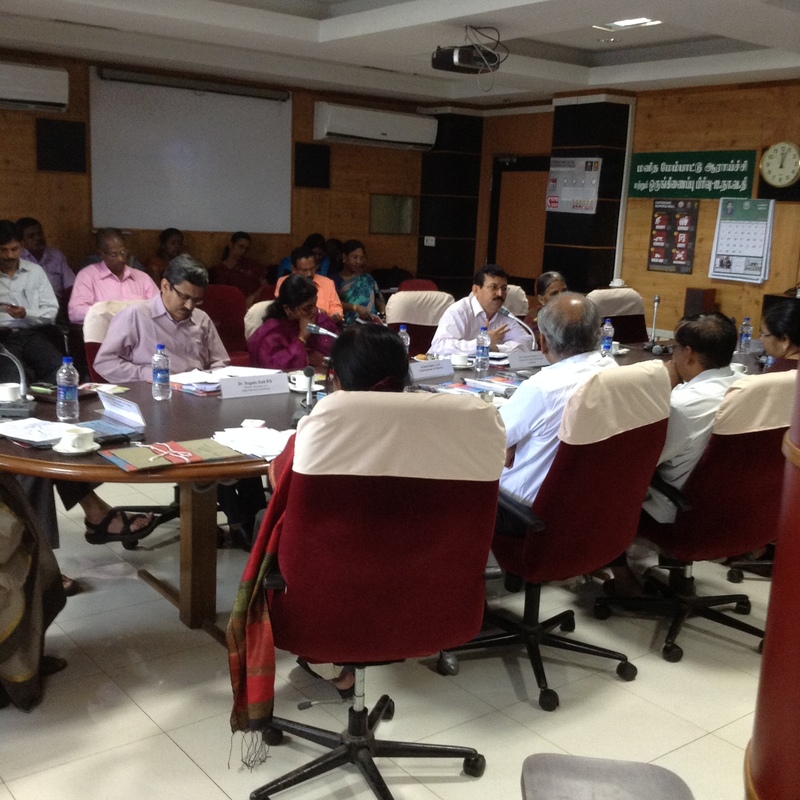 Dr Rajagopalan suggested that members of civil society should also be consulted in the formulation of this plan, in order to conduct a gender audit of disaster management policies. The Director of AIM pointed out that it had been useful to have AIM step in, since the formulation of this plan had been shunted from department to department earlier. Ms Gopalan noted the cyclone shelters lying empty in Andhra Pradesh because there was no community ownership of the shelters. The Director of AIM pointed out that specialized shelters were unlikely to work effectively. Rather, the creation of multipurpose centres would be recommended. Members of the TN Disaster Management Agency gave an overview of their plan to increase community ownership of shelters by transforming schools, community halls and training centres into shelters. The Revenue Department and the Public Works Department would maintain these shelters, with committees at the community level. Dr Rajagopalan closed the discussion with a quick highlight of the main questions. The Times of India, Chennai, carried several stories last week on honour killings in Tamil Nadu. One of our Prajnya volunteers, Shalini Umachandran, has contributed. Shalini Umachandran and Padmini Sivarajah/TNN, Honour killings haunt women in TN too: Deepa, Times of India, July 7, 2010. “Chennai/Madurai: Megala decided to follow her heart. And paid a heavy price for it, losing her lover and being attacked and ostracised by her family and community in Manamadurai. “The latest in a series of such attacks on women in the state, the Megala case dispels the popular notion that ‘honour killings’ are confined to Punjab, Haryana and Uttar Pradesh in the north; southern states such as Tamil Nadu and Andhra Pradesh too witness similar incidents periodically. Many of them are sparked off when educated single women walk out of their homes and choose their own partners, sometimes from another community or caste. “Honour crimes and killings take place when young people challenge accepted norms of marriage, according to a study commissioned by the National Commission for Women (NCW). Megala, 20, and Sivakumar, 24, were told they couldn’t marry as they were related. Her family married her off in June. Ten days after the wedding, she ran away with Sivakumar. Her family tracked the couple down and attacked Sivakumar with ‘aruvaals’. Sivakumar died on the spot, and his killers, who included her father and brother, have been arrested. Megala, now in hospital, says that everyone in her village, including her mother, feels that the punishment is justified as she brought shame to her village and the Thevar community to which she belongs. “The accusation against her are virtually the same as those made against victims in north India. The NCW study, still underway, shows that of the 326 cases of conflict surveyed so far nationwide, 72% were because the couple crossed caste barriers and only 3% were because the couple were from the same gotra. “Women are making their own choices and in a patriarchal set-up this causes problems,” says Ravi Kant, Supreme Court advocate and president of Shakti Vahini, the organisation that is conducting the study for NCW. “Activists in Tamil Nadu endorse this view. “Honour killings are not unheard of in TN. The basis is usually caste, more often than not a Dalit boy marrying an upper caste girl,” says U Vasuki, general secretary, All-India Democratic Women’s Association (AIDWA). Shalini Umachandran, Victim count in honour crimes stays hidden, Times of India, July 7, 2010. “Honour crimes are registered under general sections of the Indian Penal Code as instances of assault, battery or homicide. If the case involves a dalit and a non-dalit, it is filed under the SC/ST Prevention of Atrocities Act as a caste-based crime. “Here, honour killings are not as rampant as in north India but they do happen and are often hushed up,” says U Vasuki, general secretary, All-India Democratic Women’s Association (AIDWA). “In Tamil Nadu, caste is the main motive behind an honour killing. The SC/ST act is stringent enough when the killings are carried out by individuals. But there are cases in which the entire community is involved — when khap and katta panchayats order killings, then you need a separate act to deal with it and instil fear in people,” she says. “Megala, the woman who was attacked on Monday and whose lover was killed, told a fact-finding team from Evidence, an organisation working in the field of human rights, that her family had kept her locked up for a month when they found she had fallen in love with her cousin, Sivakumar. She was then married off to an older man. When she ran away with Sivakumar, the family hunted them down and killed him. V Mayilvaganan/TNN, Breaking caste barrier proved fatal, The Times Of India Chennai, July 7, 2010. “Cuddalore: It was one gruesome incident of honour killing that shook the state in 2003. Newlywed D Kannagi (22) from the backward Vanniyar caste and her Dalit husband S Murugesan (25) — both graduates — were hounded, hunted down, harassed and killed by the girl’s parents and relatives. They were killed in the most brutal way. They were forcefed poison with about a dozen persons watching them die slowly in their native Puthukooraipettai village near Vriddachalam in Cuddalore district. “A chemical engineer, Murugesan fell in love with Kannagi, a commerce graduate, during their college days at Annamalai University in Chidambaram. Fully aware that their families would not approve their affair, Murgesan and Kannagi married discretely soon after they completed their graduation in May. They, however, continued to live in their respective houses until Murugesan got a job. “A top grader, Murugesan managed to get a job in Tirupur in a month and on July 3 Kannagi went to Tirupur with Murugesan. Kannagi’s father Duraisamy, who was also the Puthukooraipettai panchayat president, and his relatives had been furiously hunting for the couple. Four days later, Murugesan came to the village hoping to sneak away after taking the academic certificates from his house. However, he was caught. “He was tortured the whole day, with his relatives demanding that he reveal the location of Kannagi. The harassment continued throughout the night. When it turned unbearable, he disclosed the details of where Kannagi was staying,’’ said S Velmurugan, brother of Murugesan who was 19 years old then. Kannagi was brought to the village. “It was then that the cruel episode unfolded. Duraisamy and his relatives allegedly fed the young couple with a poisonous drink even as relatives stood mute witnesses. V Mayilvaganan/TNN, Honour killings have a southern twist, Times of India, July 7, 2010. “Thanjavur: Lakshmi has never hated anyone like she does her brothers. A victim of ‘honour’ killing, she no longer likes her caste either. Hailing from a middle class family of Kallars – a dominant backward caste – in the agrarian Tiruvarur district, 31-year-old Lakshmi now lives with her Dalit in-laws for the past one and half years. But, her husband Sivaji is no more. He was brutally murdered by her brothers in 2008, barely six months after she got married to him, just because he was a dalit. ““Though we were constantly worried about being tracked down by my brothers, we were having the happiest days of our life. We had rented a house at Malampatti village near Dindigul with the help of my husband’s friend,” recalls Lakshmi. “It was exactly five years ago that Lakshmi, a plus-two dropout, met Sivaji, an auto driver from the nearby Haridwaramangalam village who used to drive by her Magimai village daily. She was 26 years old then and Sivaji 29. The feudal caste hierarchy did not stop them. Soon the young couple were deeply in love. “Reality struck them when Lakshmi’s family learnt about the affair. Her brothers Subramanian and Sivakumar were furious at the prospect of their sister having an affair with a dalit. They threatened her and asked her to discontinue the relationship immediately. ““But I ignored the warnings and decided to marry Sivaji. I left the house and went to Dindigul along with him on March 4, 2008.” Solemnised by their friends, Lakshmi and Sivaji got married at a temple in Dindigul the same day. It was six months later that her brothers managed to track her down. ““They somehow learnt that we were in Dindigul. I later learnt that my brothers had rented a house in Dindigul and were searching for us for over a month. On September 7, around 6am someone knocked on our door. When my husband unlocked it, my brothers barged into the house and dragged my husband out. Even as I screamed, they dumped him into a car and fled away,’’ Lakshmi recalled.